Is your dog angry, or just trying to tell you something? When a dog growls, it is an indication that he is uncomfortable in a specific situation, whatever reasons that may be. As a dog owner, you can observe this behavior and discover what types of things tend to bother your dog or puppy. This makes a great opportunity for you to condition him to better relax during these situations. Many times it is the advancement of another animal or human being that will make your dog growl. And if this growl is heeded and the person does move away from it, the dog will drop the desire to continue its dramatic behavior because he appeared to have gotten his point across. It really is just another form of communication that canines use. But this communication must be understood by people, especially children. If a child is approaching this same dog and the barking is ignored, the dog may then escalate its behavior and snap, or even bite the child. Suppose for a minute that your child approaches your dog while it is laying down and it turns his head slowly away while growling at a low tone. Do you know this means? What should you do? Of course not all growling is considered bad, and in such a situation it would appear that your dog is simply trying to communicate that it is uncomfortable with you approaching and would like to be left alone. It's important to understand why dog growling occurs and what to do. Above: Ninja at 18 months enjoying an Ostrich leg bone. Many dog owners take dog growling personally. They tend to punish their dog or puppy whenever it growls at them. This is a big mistake and could lead to potentially greater behavior problems down the road. All you are doing in this situation is blocking the dog's most important way of communication. If you continue this practice then sometime in the near future, the dog may not be courteous enough to give such a warning growl and may result in immediate snapping or biting. Children should always be taught this form of communication. They must know that whenever these warning growls are given, it is always best to respect your dog and to move away from it. Teach your kids to stop doing whatever it is they are doing when a dog growls at them. Running away is not advised. They should calmly retreat to a distance that is safe, but do it SLOWLY. And advise your kids to let you know exactly what happened so that you can use this information to continue training your dog the obedience skills it needs. Why Is Your Dog Growling? Not all growls are the same. There are many reasons why you might find your Australian Shepherd growling. Does your dog feel threatened. If they have not been properly socialized and they don't trust that you are the pack leader and in control of the situation they may growl at other animal or human visitors to your home. Fear based growling should always be taken seriously as they will result in a bite if the dog feels they are backed in a corner. Is your dog growling because they are aggressive. Dogs that have not been fully trained and believe that they are in charge will try to dominate situations. This can again be dangerous for other dogs or people that come to your home or that you meet in public. Training is key here. Your Australian Shepherd MUST know that you are in charge and respect you. Allowing an Aussie to growl at and potentially bite is negligence on the owner's part. All dogs should be trained but this is especially important for intelligent, high-energy dogs like Aussies. Is your Aussie territorial or possesive of food? 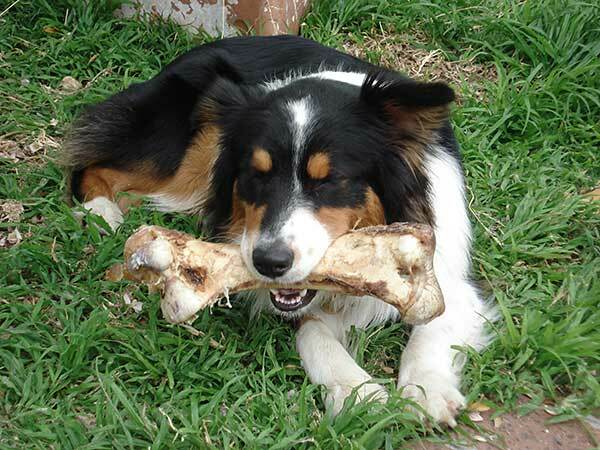 These are a couple of other reasons you may find your Australian Shepherd growling. If a dog growls for these reasons it has to be corrected. We all know how possessive a dog will get over a bone but there has to be limits. A growl today will be a bite tomorrow. As a responsible Australian Shepherd owner it is your responsibility to train them so they are not a hazard to themselves or others. Besides, well trained Aussies are a joy to own and well worth the investment. Have a look at The Guide To Australian Shepherd Training & Care for more information on training your Australian Shepherd. It will help get you started to a safe and happy relationship with your Aussie.